The Venus Fly Trap, Dionaea muscipula, is a carnivorous plant native to the bogs and swamplands of North and South Carolina. It preys on insects with its uniquely shaped terminal portion of its leaves. The leaf has two primary regions: a broad flat typical leaf-like region called the leaf-base that is capable of carrying out photosynthesis and grows out of the ground, and the trapping mechanism, called the leaf-blade or lamina, at the end of the leaf that is composed of two lobes with hinged together by a midrib. Each trap usually has between two and five “trigger hairs” on each lobe with three trigger hairs on each lobe being normal. The edge of the trap is lined with teeth or finger-like cilia that lace together when the trap shuts. The leaf-base and leaf-blade (trap) are joined together by what is referred to as the petiole. Venus fly traps have evolved to become carnivorous due to the fact that the soil that they grow in is lacking or short on certain key nutrients that are fundamental to plant growth. The media (soil) that Venus Fly Traps grow in is nitrogen poor and acidic. Without an ample supply of nitrogen, it is difficult for a plant to synthesize protein, and thus grow. Therefore, in order to supplement their nitrogen supply, Venus fly traps trap and digest insects. 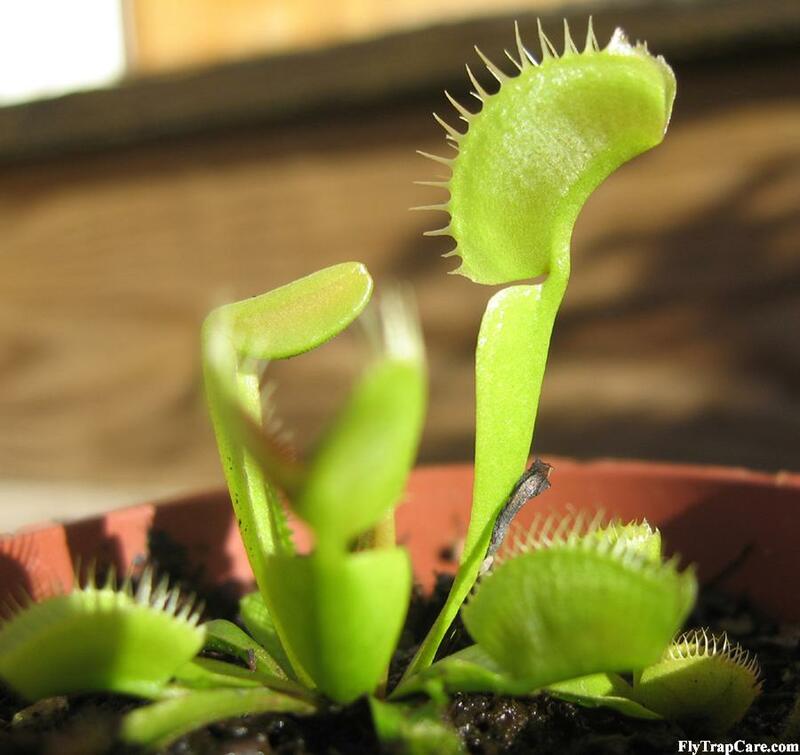 Each insect that the a Venus fly trap catches and digests is like a little piece of fertilizer for the plant, giving it a small boost of nutrients to promote growth. On the upper portion of each side of the trap the Venus Fly Trap there are anthocyanins, which are little pigments that appear red or purple on the surface of the trap. This coloration is probably what draws in most insects. However, the trap also secretes mucilage, a type of protein. So once the insect has landed on the leaf, it begins to crawl around on the leaf surface lapping up the mucilage and eventually triggering the trap to snap shut. 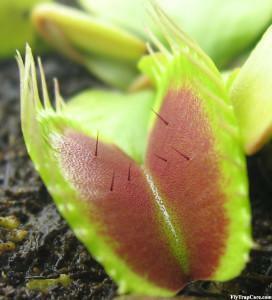 The trigger hairs are the indicators for the plant to know when there is possible prey in the trap. If two trigger hairs are touched or one trigger hair is touched twice within a short period of time (around 30 seconds or so), the trap will spring closed within a tenth of a second. The amount of time the trap takes to close varies greatly with temperature, light, plant health and other factors, but a healthy trap in warm conditions closes very quickly. The trap of a Venus Fly trap is an active trapping mechanism that is one of the fastest movements in the plant kingdom. The details of trapping process are actually quite complex and research is still being done to figure out exactly how the process works. Some ideas include extremely fast cellular growth to make the trap close and a “snap-buckling instability” that the plant controls itself. Recent research done in 2005 at Harvard University shows that the Venus fly trap relies on a biochemical and elastic process where the leaf stretches itself to a point of instability and once the trigger hairs are touched, the plant releases water into the leaf that results in the leaf slamming shut. If the initial snap of the trap is successful in capturing prey, then the trap will begin the tightening phase. This phase of the trap closing takes about thirty minutes. The struggling prey inside the trap will continue to touch the trigger hairs. This will signal the trap to continue to tighten its hold on the victim. If the prey is small enough, it can slip through the teeth of the trap and escape. Darwin noted this in his research and theorized that this would allow for prey that would be too small to provide significant nutrition to escape and prevent the Venus flytrap from using valuable energy digesting a meal that wouldn’t provide a good source of energy in return. Venus Fly Trap with a meal! If the trap is unsuccessful in capturing any prey when it closes because the prey was able to escape or it was trigger to close by a leaf, a couple drops of rain, or by a person sticking a finger or stick into the trap, the tightening phase will not occur. The trap will slowly begin to reopen and should be fully open again within a day or two. However, if the trap is triggered to close many time, it will eventually turn black and die. There is also a noticeable slowness in closing from the first time the trap is closed to the subsequent closures of the same trap. The trap has successfully captured prey and the prey didn’t escape before the tightening phase, so now the trap begins the sealing phase. During this phase, the teeth of the trap start bending upward and out in a way that they are no longer interlaced. The rims of the lobes just underneath the teeth on either side of the trap are pushed tightly together. Once the seal is tight, the digestive enzymes are released, drowning the insect and beginning the digestion process. For the next five to 12 days, the trap will remain closed while it performs digestion. During this time it will continue to secrete digestive enzymes that will dissolve the soft tissues of the insect releasing the nutrients contained within it so that they can be absorbed into the leaf. The amount of time it takes to complete digestion is dependent on the size of the insect, the age of the trap, and temperature. The bigger the insect, the longer it takes to digest. The older the trap is, the slower it secretes the digestive enzymes. And, in general, the warmer the ambient temperature is, the quicker the trap and perform digestion. In addition to dissolving the soft tissues and digesting the cellular molecules into small enough pieces so that they can be absorbed, the digestive enzymes will kill bacteria accidentally sealed in with the insect when the trap shut. Ideally, an insect should be about one-third the size of the trap. If the insect is too large or if part of it is hanging out of the trap, then a seal will not be able to be formed. This will result in the death of the trap. The trap will turn black, die, and fall off the plant. The leaf-base that remains will continue to provide photosynthesis energy for the plant, but it will not produce a new trap with which to capture insect prey. After the digestion of the meal is finished, the leaf will reabsorb the digestive fluid. This signals the plant to reopen the trap. What is left is the exoskeleton of the digested insect. This is either washed out by rain, blown out by wind, or serves as a lure for the trap’s next victim. Often spiders and ants are lured in by the dead insect and end up as a second meal for the trap. After several captures, the trap will stop working. Although Venus Fly Traps have been successfully introduced in many places in the world, there original native range is very small. 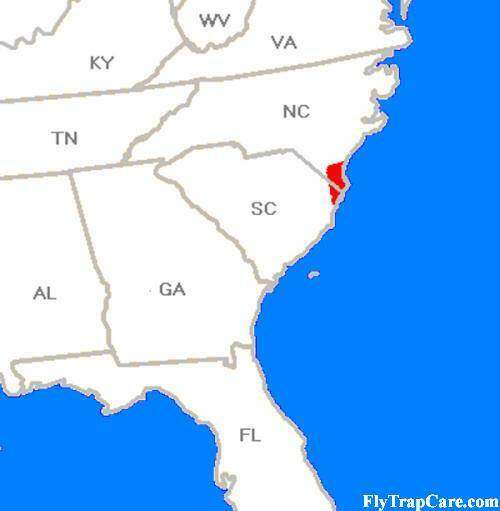 Venus Fly Traps were originally only found within a 100 mile radius of the town of Wilmington, North Carolina. 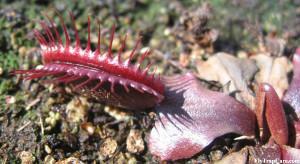 Dionaea is a monotypic genus, meaning that there is only one species in the genus Dionaea and that species is muscipula. 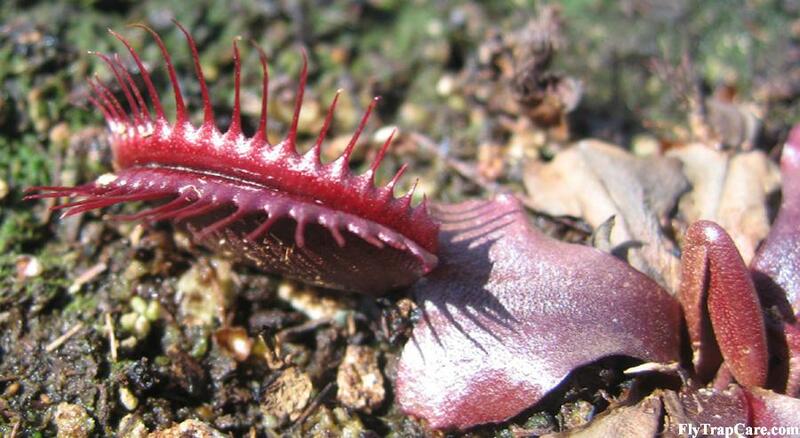 Dionaea muscipula is the latin name for the plant commonly referred to as the Venus Fly Trap. So what does Dionaea muscipula mean in plain English and where did it come from? Also, how did the plant come to be commonly called the Venus Fly Trap? The first written reference to the Venus flytrap was made by Arthur Dobbs, the British colonial governor of North Carolina from 1754 to 1765, in a letter sent to English collector and botanist Peter Collinson on on April 2, 1759. In this letter, Dobbs describes a `Venus’s flytrap` as “a kind of Catch Fly sensitive which closes upon anything that touches it.“. One of the other people that Dobbs worked with was John Bartram. At the time, Bartram was Royal Botanist to King George III for the North American Colonies. Bartram was the first person to send a specimen back to Europe, England, for further study. Bartram also coined the slang name “tipitiwitchet” or “Tippity Twitchet” for the plant that was a reference to the resemblance of the plant to the human female genitalia. This naming theme continues to surface with the perverted botanists of the 18th century. Once the plants were in England, they made their way into the hands of John Ellis, an amateur English botanist, and Daniel Solander, a Swedish botanist working in England. The venus fly trap was given the name Dionaea muscipula by John Ellis, but Dionaea was first proposed by Daniel Solander in honor of the Greek goddess of love and beauty Aphrodite, also called Dionaea (daughter of Dione). The second part of the name, ‘muscipula‘, is latin for ‘mousetrap’. Amazingly, the perverted botanists got the reference to female genitalia passed as the official scientific name of the plant. Now on to dissect the common name “Venus Fly Trap”. The name ‘Venus’ is the Greek name for the Roman goddess Aphrodite, or sometimes referred to as “Dione”; hence Dionaea. 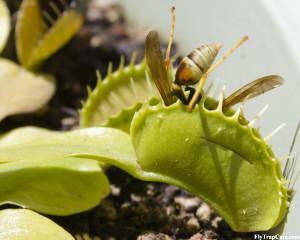 And the second portion of the name, ‘Fly Trap’, is obviously a reference to the plant’s abilities at catching insects.